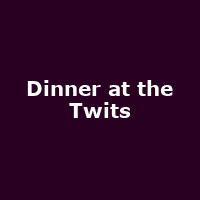 "Dinner at The Twits is a fully integrated, immersive dining experience. During the 90 minute show, there will be gripping performance, complimented by a delicious banquet, lovingly prepared by Mr & Mrs Twit. You can also visit the bar after the performance has finished. Here, you can relax and have a drink, all in the comfort of Mr & Mrs Twits' home."